For the Prevention and eradication of Woodboring insects for internal and external timber structures. 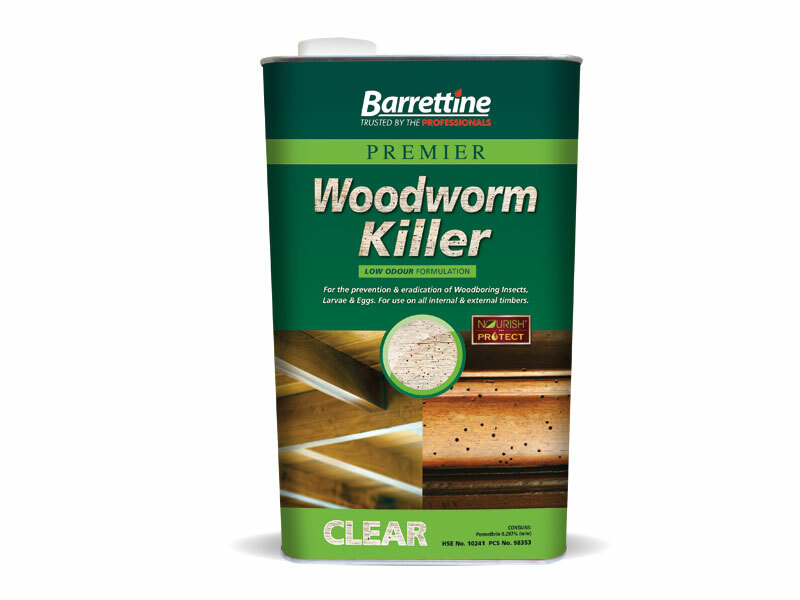 A traditional deep penetrating low odour oil/solvent based woodworm killer which prevents & exterminates woodworm and woodboring insects from timber. Ideal for treating furniture, flooring, structural timbers etc. Avoid contact with plastics, roofing felts etc. Kills all common insects including Common Furniture Beetle, House Longhorn Beetle, Powder Post Beetle and wood boring Weevils. Will also kill larvae and eggs when in direct contact. Contains 0.1 % (w/w) permethrin. A solvent based preservative for flooring, structural and other timbers. Floor coverings: treated floors must be allowed to dry and ventilate for up to 3 weeks before relaying foam backed carpets or underlay. Ensure all electrical wiring etc are in sound condition before treatment. Isolate the area of treatment from electrical supply by removing fuses before application. Brush, spray or apply directly into flight holes where possible. Coverage:- Prevention: 200ml per m2 or 1 litre to 5 sq metres. Eradication: 300ml per m2 or 1 litre to 3.3 sq metres.